California petroleum museums exhibit technological and environmental advancements, discoveries, products and local pioneers. Many outstanding West Coast museums educate visitors about the state’s extensive petroleum heritage, which began with the First California Oil Well. The American Oil & Gas Historical Society provides updated links to these museums and petroleum museums in other states. The American Driving Museum offers rides in museum cars on Sundays, a research library, museum store, and special events. Its collection includes a rare 1886 Benz Motorwagon. The Automobile Driving Museum in El Segundo, California, preserves automotive history, interpret the historical significance, educate our guests and provide them with the opportunity to take a ride in one of the museum’s historic collector vehicles. One of best California petroleum museums, it’s a premier destinations for car enthusiasts and includes a rotating collection of 130 classic, antique and vintage automobiles on display. Visitors experience a wide range of vehicles from years gone by. The museum is committed to the preservation and maintenance of these vehicles. The Automobile Driving Museum offers a diverse collection. The oldest example is an 1886 Benz Motorwagon and the newest is a one-of-one 1999 350Z concept car that was donated by Nissan. The core of its collection features some great examples of Packard spanning from 1916-1958. The museum is located half a mile south of LAX at 610 Lairport Street • El Segundo, CA 90245 • Tel. (310) 909-0950. In 1898, four years after purchasing 1,200 acres of Orange County land to be used for looking for new petroleum fields, the Union Oil Company discovered an oil field with its first well. The Olinda Oil Well No. 1 well brought prosperity and cable-tool rigs into the hills of Brea and Olinda, “paving the way for the thriving city that Brea is today,” notes the City of Brea. The Brea Historical Society was organized in 1971. The Brea Museum and Heritage Center is located in historic City Hall Park near the intersection of Brea Boulevard and Elm Street in Brea, Orange County. The Union Oil Company headquarters building, built in 1890, is home of the California Oil Museum. This museum in Santa Paula educates visitors with interactive displays, videos, working models, games, photographs, restored gas station memorabilia, and an authentic turn-of-the-century cable-tool drilling rig. Teachers and students can watch a miniature drilling rig bore into the earth, experience the excitement of “wildcatting” for petroleum, and learn how Native Americans first used natural oil seeps. The Lundgren and Bennett collections of gas station memorabilia are one of largest displays of vintage gas pumps in California. In addition to the permanent petroleum exhibits, the museum presents new exhibits of science, technology, history, and art throughout the year. Unlike all other California petroleum museums, the exhibits’ building is the original home of Union Oil Company and was built in 1890 for $38,000 by oil pioneers Thomas Bard, Lyman Stewart, and Wallace Hardison. “Boy Evolves Tiny but Perfect Derrick” read the 1928 local newspaper headline about 16-year-old Julian Hathaway and his model derrick — which drilled a 90-foot well. The Hathaway Ranch Museum is a nonprofit foundation dedicated to preserving and presenting the eras of farming, ranching and oil development in early Fulton Wells and Santa Fe Springs. “We are a museum of family and community history located in the heart of Southern California, preserving five generations of memories and artifacts,” the website notes. The museum’s predecessor, the Rancho Santa Gertrudes Historical Society, was founded in 1983, and the Hathaway Ranch Museum was incorporated in October 1986. The five-acre site – about 15 miles east of downtown Los Angeles in Santa Fe Springs, at 11901 Florence Avenue, between Norwalk Boulevard and Pioneer Boulevard – holds more than 140 years of Hathaway family and community history. Founded in 1941, the Kern County Museum features an award winning hands-on oil exhibition, Black Gold: The Oil Experience. The Kern County Museum was founded in 1941 and serves more than 85,000 people each year from its 16-acre site north of downtown Bakersfield. The museum includes “Black Gold: The Oil Experience,” a permanent $4 million science, technology and history exhibition. It features learning environments for all ages — including a simulated undersea diving bell to learn how oil is formed. The museum also has a large collection of historic photographs. With Kern County providing 64 percent of California’s oil production, oil has been a crucial component of the local economy since 1895. The 9,640-square foot Black Gold exhibition and surrounding 2.3 acres examine how oil is created and the many technologies used for discovering and extracting it – and the changing role of industry workers and families. Visited by more than 550,000 people since its 2002 opening, the oil exhibition was designed and fabricated by Museum Arts of Dallas, Texas, a frequent creator of petroleum industry exhibitions. This historic Orange County site includes Olinda Oil Well No. 1 – drilled in 1897 – the oil company field office, a jack-line pump building, and a storage vault, which some believe was once used as a jail. Public amenities have been added, including restrooms, a popular picnic area, outdoor historical displays, and landscaping. Docents help research exhibit materials, give tours and staff the museum. They work closely with the rangers from California State Parks and staff from the City of Brea. The museum and park provide free interior and exterior exhibits telling the story of the geological and historical significance of the site, as well as the importance of the oil industry to the development of southern California. More than 150 classic cars, trucks and motorcycles are exhibited in the 300,000 square feet of the Peterson Automotive Museum in Beverly Hills. In June 1994, Margie and Robert Petersen fulfilled a longtime dream when they became founding benefactors to start the Petersen Automotive Museum through the Los Angeles County Natural History Museum. Located at 6060 Wilshire Boulevard in Beverly Hills, the Petersen Automotive Museum today focuses on the interpretive study of the automobile and its effect on the culture of California — and America. With three floors of exhibits and a collection of more than 300 rare and historic automobiles, the museum is expanding its educational programs to reach out to students, adults, families and educators. Encompassing more than 300,000 square feet, its exhibits and dioramas feature more than 150 rare and classic cars, trucks and motorcycles. One of the many critters of the “Coalinga Iron Zoo” visible from highway 33. The museum occupies a space that once housed the first Baker Oil Tools machine shop. 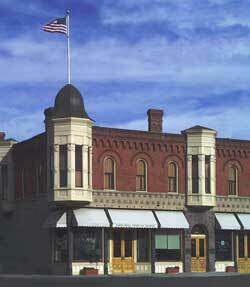 In 1903, Reuben Carlton founded the Coalinga Oil Company. He later helped to establish the first National Bank of Coalinga, California, in 1906, and assisted in creating the Power and Gas Co. The Baker Foundation in 1958 offered the old tool shop to the city for use as a museum, which opened in 1961. The nearby “Coalinga Iron Zoo,” created in the very early 1970s, features a menagerie of decorated oilfield pump jacks. Visit this museum in the San Joaquin Basin and Coalinga oilfield at 297 W. Elm Street. “Oildorado Days” — which began in 1946 — annually celebrates California petroleum heritage. 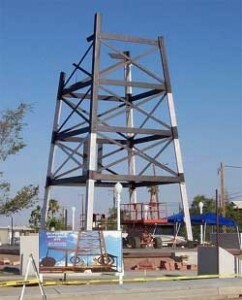 Among the 2010 highlights was the unveiling of an Oil-Worker Monument. The 30-foot-tall derrick includes and bronze sculptures of petroleum pioneers. In the 1920s, more than 7,000 wooden derricks covered 21 miles in southwestern Kern County. In Taft, the West Kern County Museum, run entirely by volunteers, is dedicated to collecting, preserving, exhibiting and interpreting artifacts, books, and equipment that tell the story — particularly in West Kern County. The museum tells the story of the many businesses, communities and people that benefit from the petroleum industry. It is dedicated to increasing the public understanding of the Midway Sunset field, which, by 1915, produced half of the oil in California. At the time, California led the nation in oil production. Editor’s Note – Among the screen credits of the 2008 Academy Award-winning movie “There Will Be Blood” are several petroleum museums. Cable-tool derricks played a prominent role in the movie. After several museum visits, Production Designer Jack Fisk purchased a copy of the 1914 blueprints from the West Kern Oil Museum. See the“Hollywood Goes Roughneck” article in the March 2008 Petroleum Age. The American Oil & Gas Historical Society preserves U.S. petroleum history. Support this AOGHS.org energy education website with a contribution today. For membership information, contact bawells@aoghs.org. © 2018 Bruce A. Wells.